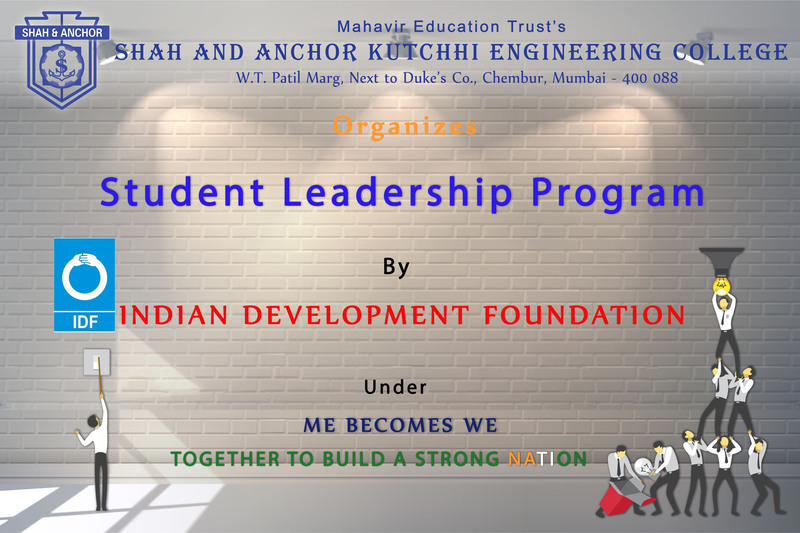 Event Description Shah and Anchor Kutchhi Engineering College organizes “Student Leadership Program by Indian Development Foundation ” for SAKEC students under the umbrella of ME becomes WE: Together to build a Strong Nation. IDF Team Members will train the SAKEC students who will be called as Mentors. Mentors will train School students because student days are the most important part of upbringing in one’s life. The mentors will be later assigned the task in different schools to train school students. The school project will be closer to the Mentor’s location to save travel time. Date & Time of Event 19th September 2018, 10:00 A.M. Onwards.